There is a continually evolving list of amazing writers out there composing thought provoking content about Disney history and experiences. Some voices in the community come and go and some shine so brightly that the move on to the next level. One such author is Sam Gennawey of SamLand’s Disney Adventures, who released the book Walt and the Promise of Progress City last year. Recently, Sam and Ayefour Publishing sent me a copy of the book to review and I was very excited to dig into it the day it arrived. Sam starts out with his personal connection to the parks of Disney and the reason this topic provides a passionate canvas from which he has launched the remainder of a book. There are certainly those who share the same memories of Progress City as Sam, but the tale is so approachable that the rest of us have similar experiences that have taken hold of our hearts and driven us down our paths of investigation. Progress City is not an easy topic to tackle. From Walt Disney’s dream of a continually evolving city highlighting all the best the world’s industries had to offer to the reality that never quite came to fruition. Progress City is a razor thin combination of futurist ideals, architecture and philosophy, and Sam Gennawey handles each aspect in due time, building upon previous ideas we have been given. Reading Walt and the Promise of Progress City is like a fine dining experience, where you cannot rush through the event, but you must chew on what is presented and let it settle in as digest into your memory. Combining interview and stories, introducing crucial terms in the planning lexicon, and detailing the evolution of Progress City, Sam does not provide a historical narrative, but through his words he crafts a living blueprint of the world Walt wished to build. This is not a one dimensional story about a single individual and his fantasy. The worlds created by Walt and those who followed in his trailblazing footsteps over the past six decades is an amazing story to be placed stone by stone. Want to know about an airstrip in Walt Disney World? Or how about a ski resort that was to be built and managed by Disney? Think there isn’t a connection between to the two? The rub is everything ever built under the name Disney is carefully woven from all that has come before it, design and planning at its finest. If it has been built by Disney, you will find a glimmer of it somewhere between the two covers of Walt and the Promise of Progress City. My inability to put a book down is the highest praise that I can heap on a book. In the case of Walt and the Promise of Progress City, I woke up on a vacation at 4:30 in the morning to continue reading and finished the entire 366 page volume before the end of the first week I had it. Sam has something special here, a rare educational text that embodies the spirit of Walt and carries with it the stories that well-versed armchair historians clamor for. This is, without a doubt, one of the best books I’ve read in the past couple of years. I cannot wait to see what Sam comes up with next. 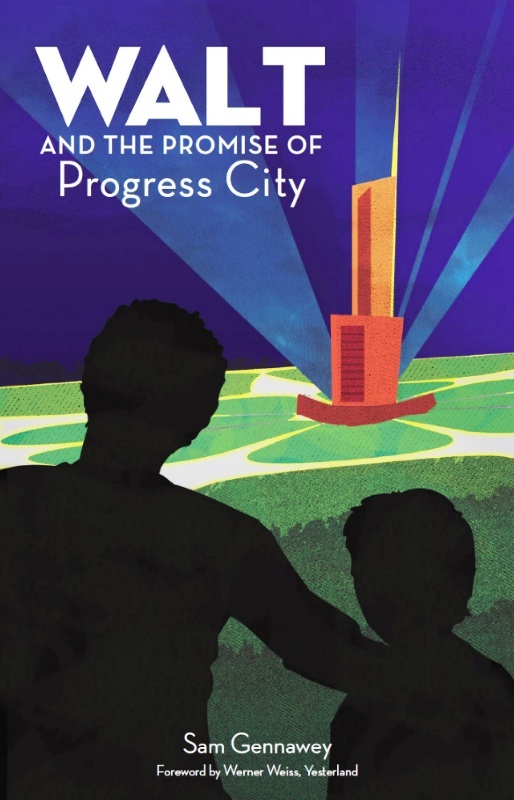 Should you wish to add a copy of Walt and the Promise of Progress City by Sam Gennawey to your must read, reference or books you share with other enthusiasts shelf (and why wouldn’t you want a copy?) you can find it at Ayefour Publishing. I also loved this book! It was a great read!